Following on from looking at the biggest figure in the Marvel Universe series, the mega-big Galactus, I'm having a look this evening at the latest figures from the normal waves of Hasbro's 3 3/4" Marvel line. I generally don't buy the Iron Man / Wolverine / Spiderman variants that tend to come with each wave, just the characters new to the line, so from Wave 10 I bought Captain Britain, Multiple Man, Mystique and Ghost Rider. 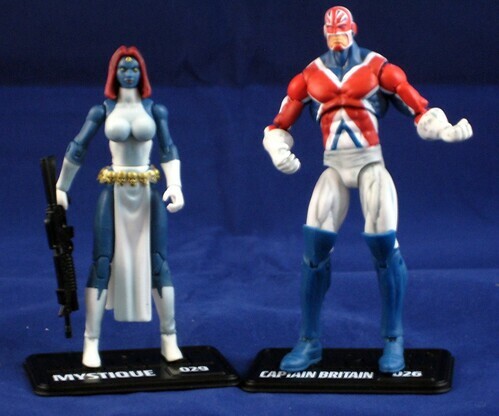 Captain Britain is a favourite character of mine and one I'm happy to see in the line. The only niggle here is the way in which the gray wash that's been used on the white areas of CB's uniform has accumulated in a few places, particularly on his gloves. It's just a little distraction, and I do understand that a wash on a white section looks better than just plain white. Otherwise, the paintwork on this small figure is great - nice clean lines, and all stripes well applied and executed. I'd love to see some of CB's other costumes as variants later on in the line, as this helmeted version is the main one we've seen toy-wise. I currently only own one Multiple Man but I will surely be hoping to get more to build up a bit of a Jamie Madrox army. This is an early costume, and I'm certainly hoping for variants here - Classic and Modern X-Factor are both musts for a well-rounded X-Collection! The rather simple design here is complimented by metallic gold paint which is applied in nice clean lines. The face on this figure has come out very well for the scale. A great figure to have, but I am keen for the modern versions of the character! Mystique is a welcome addition to the line, which is short on female villains, and she's also one of the better female figures in the line overall. Some of the heads on the female figures haven't come out particularly well paintwise, but this one is pretty flawless. One of the things I don't like on some of the MU females are the breasts, which are a just a tad too big - something that is really noticeable on this figure with the white paint in this area. They look more like little golf balls glued on than something that naturally belongs there. That aside, this is a great figure - her skull belt and her sash are well crafted and paint is very solid all around. I'm not quite sure she needed the big bazooka, but it'll be fun for someone to use if not her. Ghost Rider is the clear winner for me in this wave. His flaming head is well designed, and I love the bit of a smirk that comes through in his facial "expression" - pretty cleverly done! The detail of sculpting on his uniform is excellent and gives a great sense of texture. His fiery chain is a great accessory, and unlike some of these types of add-ins, he can actually grasp it easily so it's a practical winner as well as an aesthetic one. From what I understand, the different Marvel Universe Waves / Two-Packs are produced at more than one factory, and there seems to be a sliding range of quality between the different producers. These seem to be from one of the "good' factories - overall quality control and paint apps are very good. All this makes this a great set, and great additions to the Marvel Universe line! You can see more pics of these and other Marvel Universe figures at Facebook, discuss this at the AFB Forum, and comment on this post to enter the November AFB Comment of the Month Contest! Y'know the disappointing thing with GR is that there's no bike immediately for him. Hence getting one of the Wolvie origins packs that has Wolvie on a bike is of use (even better if you got two such bikes). So Mystique comes with three bazookas then? 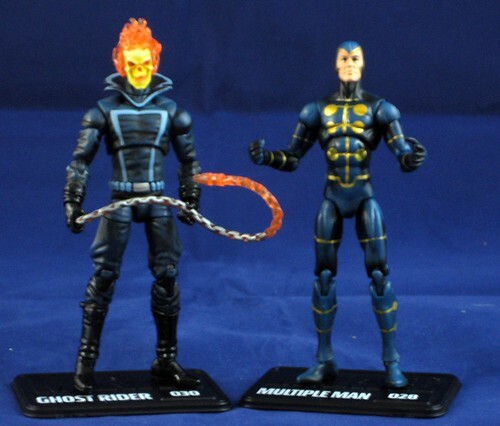 I was only able to get Ghostrider and Multiple Man. What was so awesome was that I was able to get 4 Multiple Men in one go at less than retail price when some one let all of his go. Love that ghost rider. Definitely gonna pick him up. Shame more of the wave doesn't have his awesome thigh swivels. And crap now I need that Wolvie bike. The Capt. Britain is nice as well though. Shadow cat. for Mystique was out of stock and also glad Hasbro decided to pack mystique with some heat for a change. I have not picked up any of these Marvel figures yet been holding off until i can find Ghost Rider who i have not seen yet.